SEMANTiCS 2017 is an international event on Linked Data and the Semantic Web where business users, vendors and academia meet. Widely recognized to be of pivotal importance, it is the thirteenth edition of a well-attended yearly conference that started back in 2005. It offers keynotes by world-class practitioners, presentations and field reports in diverse tracks, talks addressing a variety of topics, and panel discussions. And, of course, ample opportunities for networking and meeting like-minded professionals in an informal setting. Interested in the latest developments around Linked Data? 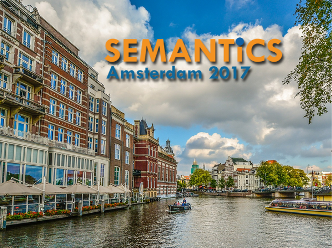 Visit SEMANTiCS 2017 on 11-14 September in Amsterdam and join the conversation. ISA² is coming to the conference! Visit our stand! Read the blog post of Mario Campolargo on the ISA² presence at SEMATiCS 2017!